of the 1960’s and 70’s, namely Roy Wood and Jeff Lynne. Mike Tyler started his music career at a young age by playing piano at a pub in Kings Heath. After entering and winning a local talent contest, he was asked to join Billy King and the Nightriders which he did after changing his stage name to Sheridan. The group attracted a large local following and after various personnel changes, Sheridan became the lead singer and frontman. had previously played in a group called The Hound Dogs. Bass guitarist at the time was Brian Cope. 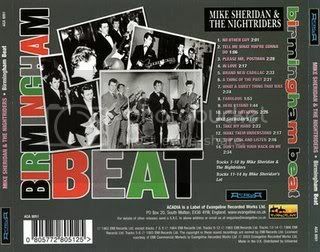 Mike Sheridan and The Nightriders soon established a reputation around Birmingham as one of the most accomplished bands on the scene at that time. came up to Birmingham to audition local beat groups at the Moat House Club in the Bull Ring. Of the 13 bands that had been recommended, five including the Nightriders were signed-up by Paramour to the Columbia Records label. 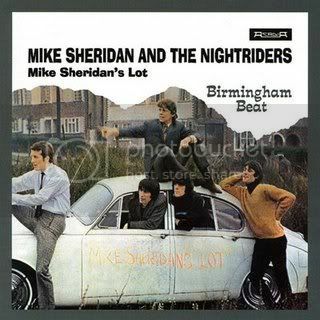 Mike Sheridan & The Nightriders first record release was Tell Me What You’re Gonna Do but in late 1963, Brian Cope left the group and was replaced by Greg Masters from Nechells who had played in The Dominators and The G Men. The next single to be recorded by the Nightriders at the famous Abbey Road Studios in London was Please Mister Postman (recorded on 22nd November 1963 – the same day President Kennedy was assassinated) and although it didn’t chart it sold well locally and gained the band much attention. The Nightriders respected lead guitar player, Big Al Johnson, left the band in 1964 after appointing a young successor by the name of Roy Wood. Roy Wood was born in Birmingham on November 8, 1947. He started playing drums and harmonica at an early age, turning to the guitar when he was about 14 after being influenced by instrumental groups such as The Shadows and The Ventures. Six months later he had joined his first band called The Falcons and was playing Chuck Berry and Little Richard style rock ‘n’ roll. It was at about this time that Roy Wood first started to write songs, and by 1963 had joined Gerry Levene and The Avengers, a group that also included future Moody Blues drummer Graeme Edge. VOX AMP AND BINSON ECHO. Roy Wood was chosen out of about a dozen applicants and his talent as a guitarist and singer became immediately noticable. He also introduced comedy into the Nightriders act on stage by doing Donovan and Dusty Springfield impressions while wearing a suitable wig! was What A Sweet Thing That Was/Fabulous released at the end of 1964. In early 1965, Mike Sheridan & The Nightriders, like many British groups in the early 1960’s went over to Germany to undertake some bookings. in 1965, and the group’s name was changed to become Mike Sheridan’s Lot. by being Roy Wood’s first songwriting effort to be published. Although not an exceptional composition, it does feature some excellent guitar work but Mike Sheridan, not Roy Wood sang the vocal on it. and recorded with future Pink Floyd producer Norman Smith), Roy Wood left the band to become a founding member of Birmingham’s hit group The Move. and Mike Sheridan carried on as the frontman for a short time before also leaving. and he had also previously been a member of the Chads (originally known as The Sundowners). After the release of a final Nightriders single, the band was re-named The Idle Race and a change in musical direction followed (see Idle Race). Mike Sheridan continued to perform around the Midlands for a while as Mike Sheridan’s New Lot with a line-up of his consisting of Joe Dignam on drums, guitarists Pete Oliver and Terry Wallace (see Carl Wayne and The Vikings) and Colin Timmins on bass guitar. They released a single in 1966 and Mike Sheridan later joined up with Move bass player Rick Price to form the group Sheridan-Price with whom he also recorded an album (see Sight and Sound). Mike Sheridan retired from music in the early 70’s to start a successful business selling potatoes. with his wife Suzi Sheridan. Today’s line-up of the Nightriders include Rod Godwin who has worked with Jimmy Powell, Cathedral and Coventry band Jigsaw as well as many others including Badfinger. The line-up also features veteran musicians Phil Middleton and Nick Cripps. Lo I wonder if you can help I picked up a enamel badge with a white background and a black sillouete of a cowboy on a horse with the letters the nightriders I looked it up and it took me to this website I can’t find a image of the badge I collect enamel badges and I am trying to find out more about this? ?